Mention plastic surgery and immediately, thoughts of breast augmentations, facelifts, and liposuction come to mind. Generally speaking, cosmetic surgery is fine for women, but is taboo for men. After all, what “manly man” would have anything to do with elective surgery? Men accept their physical flaws, and wear their scars like merit badges. But aging affects us all and creates problems that are easily corrected through cosmetic surgery. The most common procedure among men is a blepharoplasty, which corrects sagging eyelids. As such, it is a topic worth addressing. By trade, I am an airline pilot, so having good vision is crucial. Most of a jetliner’s switches are located on panels above my head, thus losing peripheral vision is a problem. By age 56, my declining vision due to sagging eyelids was making it increasingly difficult to identify switches; particularly at night. With no exaggeration, my eyelids had reached the point where my eyelashes were all that kept my eyes open. Not only did this impair my vision, but I felt fatigued before flying even the first leg. Since both of my parents required blepharoplasty surgery, it was no surprise that I needed it myself. because this problem is so common among middle-aged people. To qualify, you must first take a peripheral vision exam. This is done by staring into a bowl-shaped field of view and punching a button when you see lights. This test is done once with your normal vision and then repeated with your eyelids taped open. In my case, the test revealed that I had lost one third of my peripheral vision. A few weeks later, I was notified that my insurance company had authorized payment for the upper eyelid surgery. Since my lower eyelids were equally affected, I opted to have them done at the same time at my expense. I had the option of having the surgery in the hospitals’ day surgery clinic, but this procedure is also performed in clinics. Following a brief meeting with my doctor and the anesthesiologist, the anesthesiologist smiled and said it was time to take a nap. Hours later, I awoke with my wife at my bedside, completely disoriented, and staring at a nurse who kept saying, “On a scale ten, how would I rate my pain?” I wasn’t in horrendous pain, but I certainly didn’t feel normal. After answering “five”, I was given a pain killer through my IV, which I would have been better off without. I made it home okay, but I was quite nauseous from the medication. This queasiness was far worse that any pain associated with the surgery. The first 48 hours were the worst, but laying a small bag of tiny frozen peas over my eyes considerably reduced the pain and swelling. My biggest problem was sleeping in a recliner to keep the pressure off the face. The doctor prescribed Valium, but I found Tylenol PM worked better because it left me less disoriented when I awoke. Although my eyes didn’t hurt, the area around them was traumatized, so washing my face was difficult. I quickly learned that soft wash cloths were a godsend. Anyone who had had facial surgery will have doubts when looking in the mirror for the first time. This is normal since your face is swollen and bruised. I was better off than most, having seen my father the day of his blepharoplasty. As expected, my bruising and pain decreased with each day. I was driving three days after my surgery, and although the peripheral vision wasn’t perfect, my only hindrance was the glare. Having open eyelids made my eyes extremely sensitive to light. It was almost unbearable being in sunlight without wearing sunglasses. Wearing a brimmed had not only helped with the glare, it helped reduce swelling. [A couple weeks] passed before I could get my sutures removed. Two days prior to my appointment, I had to trim two sutures that were slipping out and poking my eyes. While my PA removed the sutures, she said it wasn’t unusual for this to happen. I expected to leave there without any stitches, but later learned that I still had a lot of self-dissolving internal stitches in me holding things together. The minor discomfort from these stitches lasted for months, but eventually it went away. Of more concern was the swelling in my eyes, not the areas surrounding them. I was not only uncomfortable, but my eyes appeared gooey. My doctor prescribed steroid eye drops to correct this problem, but the drops failed to eliminate the problem. After weeks of this swelling, my surgeon prescribed a lower-dose steroid that could be used for an extended period. Eventually, the problem went away. My surgery healed quicker than the nerve endings. For months, it felt like I was wearing swim goggles. No one else could notice this odd sensation, but it took a long time before my face felt like it was my own. My doctor later said that taking Vitamin B6 would help in reconnecting the nerves. This was another piece of advice I could have used prior to my surgery. I don’t know whether taking these vitamins earlier would have changed my outcome. A small cist near the corner of my left eye was the result of a suture knot that had yet to dissolve. For the most part, this cist caused minimal discomfort, but I still knew it was there. Since knots have twice the material, it takes much longer to dissolve. The benefits from this surgery far outweigh any side effects. Besides seeing clearly, I look ten years younger. I can now perform my job better and am not as tired. My only regret is not having this surgery four years ago. What Surgeon Should I Use? I found Dr. Linda Huang through Denver’s 5280 magazine’s Top Doctor’s list. I was impressed by her reviews, education, and consultation. I was equally impressed with her demeanor, follow-up phone calls, and subsequent office visits. A lot of cosmetic surgeons can perform blepharoplasty. Take your time finding someone you are comfortable with. My approach to the eyelids has evolved over the years. 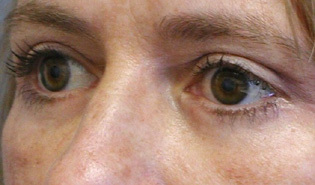 When doing eyelid surgery it is so important to rejuvenate the lids, and NOT make them just look hollowed out. In order to do this, I use a variety of procedures designed for each person’s specific problems. This young lady is very active and athletic and is outdoors a lot, which has resulted in excess skin around her eyes. I did more tightening on her lids, but also did fat transfers to her cheeks. These fat transfers help build up the tissue sort of like an all-natural cheek implant. They last a long time, and can give a nice freshening to the lids and cheek to help avoid that hollowed out look. Now if you look at her eyes, they look truly refreshed. This lady had inherited a “tired” look to her eyes that she swears was there even when she was a child. This “tired, baggy look” just ran in her family and she knew as time went on that it would only get worse. She had both her upper and lower lids done, as well as some extra fat placed into her cheeks. The fat is very carefully piped into the area with a very small needle, like frosting on a cake. This means that it doesn’t shift, but does mean there is a fair amount of bruising since it involves a lot of little injections. You will be swollen and tight for the first few weeks, but if you weren’t then six months later it could all be back again. 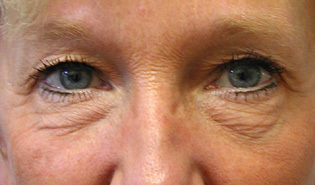 The surgery for eyelid rejuvenation usually lasts at least 7 to 10 years. These after photos were taken after 5 weeks, with make-up on. Just to show that with make-up, and incisions are usually well concealed in a short amount of time. The scars will usually take up to one or two years before they completely fade. Sometimes make-up cannot hide dark circles and bags. If people ask you why you look so tired, and you’re not tired, perhaps it is time to consider surgery. I really try to make your eyes look refreshed and youthful, not just operated on. The extra skin is removed, but the muscles and tissue below are tightened and repositioned, rather than being discarded. It gives the eyes a fuller, more youthful look. In addition, I have added fat into her cheeks to make them look more full and more dramatic. Asian eyelids are beautiful, but sometimes they lack an upper crease. This makes it difficult to apply make-up, and can make the eyes appear smaller. Adding a crease can create a more open look, and yet still maintain her ethnic appearance.